The Astor family’s tradition of owning opulent hotels began with the original John Jacob Astor who opened his lavish Astor House on June 1, 1836. 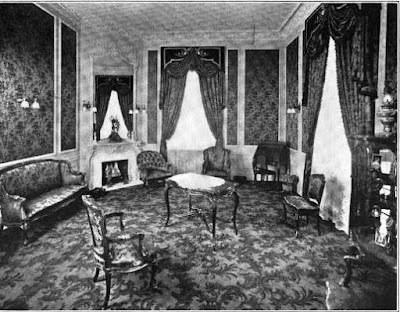 Generations later things grew tense among the family when William Waldorf Astor demolished his father’s mansion and erected the Waldorf Hotel on its site in 1893—a deliberate irritation to his aunt Caroline Schermerhorn Astor who lived next door. 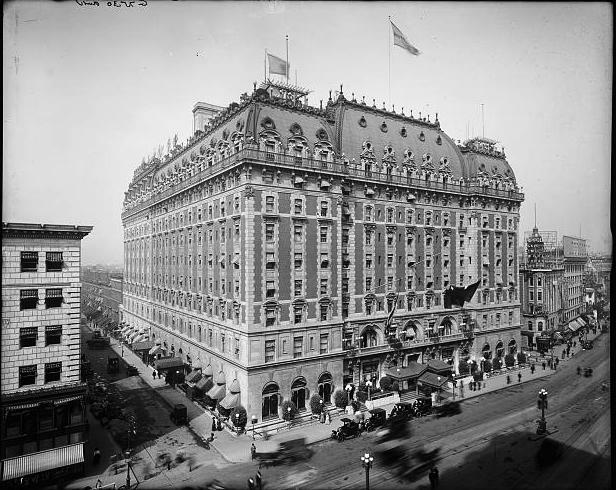 In response John Jacob Astor IV replaced his mother’s house with the Astoria Hotel. 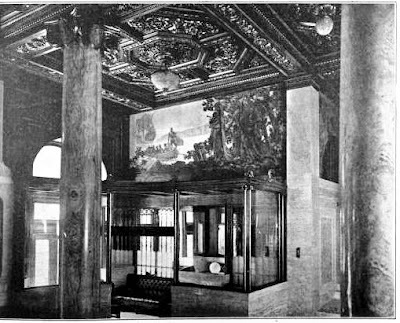 A connecting corridor, “Peacock Alley” and a hyphen joined the Waldorf-Astoria in an edgy truce. 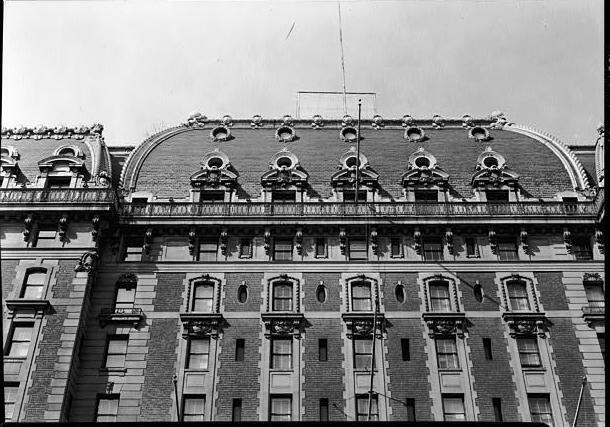 The same year that William Waldorf built the Waldorf Hotel, he laid plans for the immense Netherlands Hotel on Fifth Avenue and 59th Street—diagonally across from the Plaza Hotel. But when his cousin began construction of his extravagant St. Regis Hotel in 1901, William countered with a surprising move. The newspaper reported that the “façade will be in the style of the modern renaissance, of limestone and red brick, crowned with a high curved mansard roof of slate and copper, with massive stone dormers.” What The Times termed “modern renaissance’ is known as Beaux Arts today. The newspaper slightly overstated the costs. 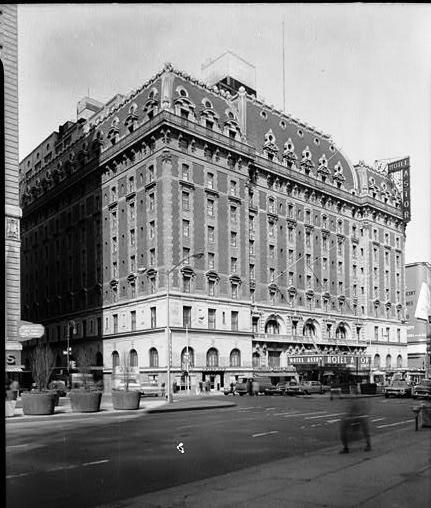 In actuality the Hotel Astor cost $5 million, and the St. Regis $3 million. 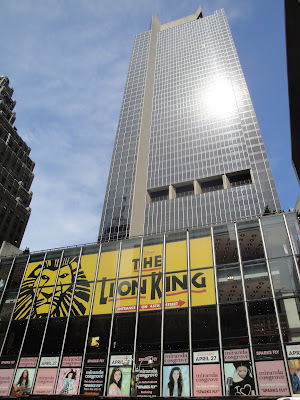 And despite their opulence, the New-York Tribune was unimpressed, predicting they would soon be left in the dust by newer and grander hotels. 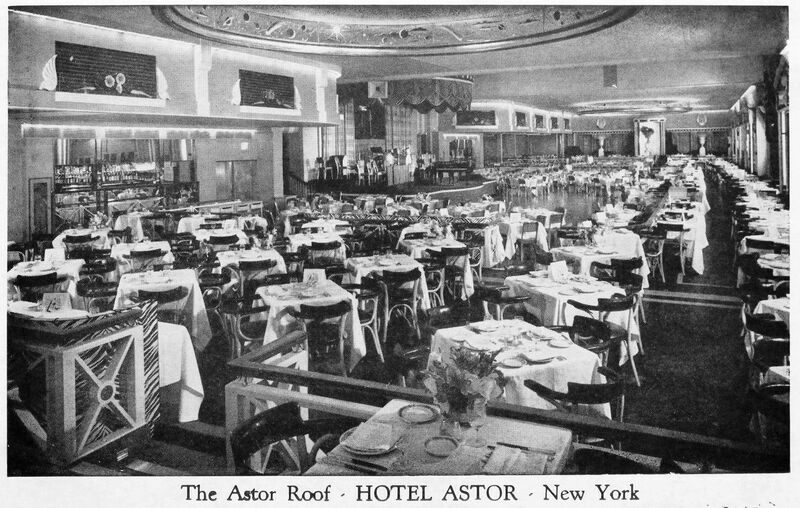 The Hotel Astor, under the management of William C. Muschenheim, had opened for a press preview on August 28, 1904. Journalists were shown some of the 500 rooms, each of which had a “long-distance phone and a temperature regulator.” One innovation was a trash incinerator, “cremating all its rubbish and dispensing entirely with the early morning garbage removal noises,” noted the Tribune. It was the first even installed in a hotel. The elaborate interiors included themed rooms—the College, Chinese, Spanish and East Indian halls, the “Orangerie,” the “Yacht Cabin” with portholes offering views of New York Harbor; and a roof garden. 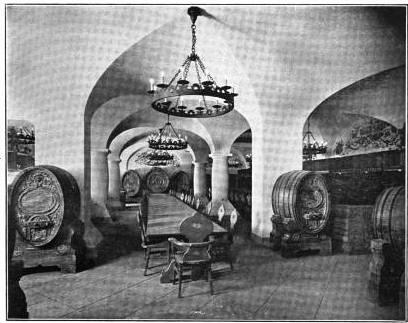 Below street level was an East Indian grill room and, below that, a rathskeller meant to reproduce the Heidelberg Tun. 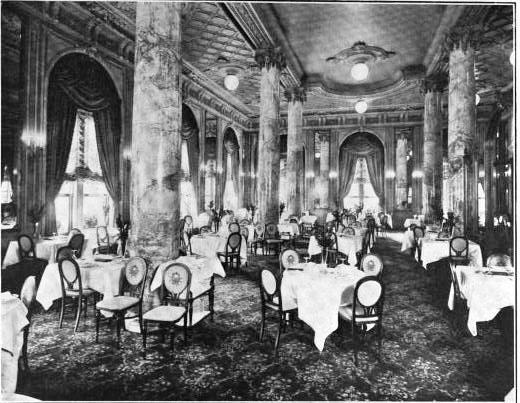 The Evening World described the 22-foot high “Italian Garden,” or “Orangerie,” as “a café for men and women in the centre” of the hotel. “The tables are of a soft, light green, unrelieved with napery, and the entire garden is hung with green things. The whole is lighted with soft violet tints that come out unseen from flowering plants and swinging arbors of trailing vines. 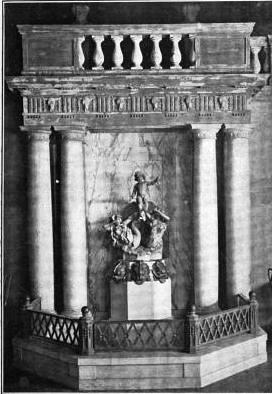 In the rear is a fountain, the centre of which is set with a piece of beautiful Italian statuary imported by Mr. Muschenheim.” Live orange trees and palms were placed among the tables and the ceiling simulated the sky, including an electrically-lighted moon. 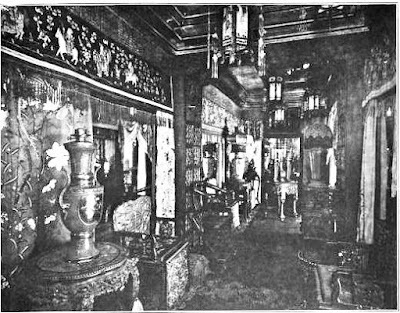 “On entering the main lobby from the street there will be found on either hand two marble and bronze stairways leading to a mezzanine gallery overlooking the lobby, the palm garden, the restaurants, and the billiard room,” said The Times. Artist W. D. L. Dodge had executed four murals for the lobby, two of which depicted “ancient” New York, while two represented the modern city. 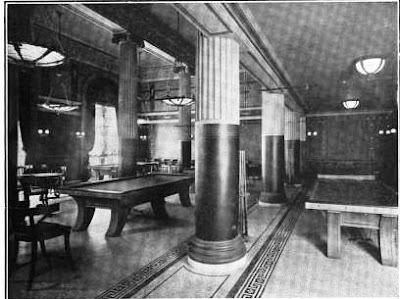 The billiard was decorated “in Pompeian style,” the bar was Flemish and included a painting of the old Longacre Farm by Edward G. Unitt. In the mansard level were the private dining rooms. 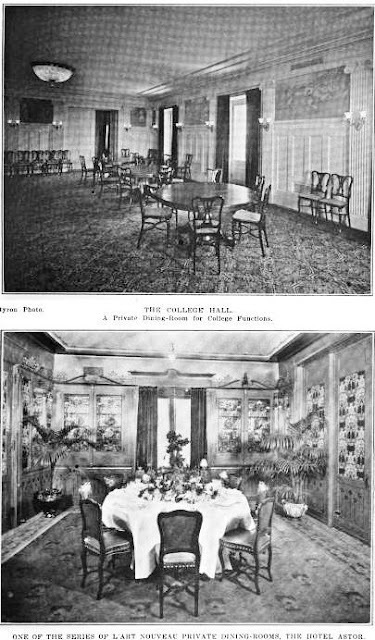 The Louis XV-style Banquet Hall was capable of accommodating 500 guests; the Ballroom (which could be combined with the Banquet Hall) could seat another 250; College Hall (which included murals by A. D. Rahn of athletic games) was Colonial in design could seat 100 persons; and there were 12 smaller private dining rooms. A special feature of this level was the Grand Promenade, 130 feet long, where well-dressed patrons could be seen. “Here is a statuary display which is said to be unrivaled in America,” noted The Times. In the basement, along with the American grill room, were the barber shop, manicuring and chiropodist parlors, toilets, baggage rooms and the receiving department. 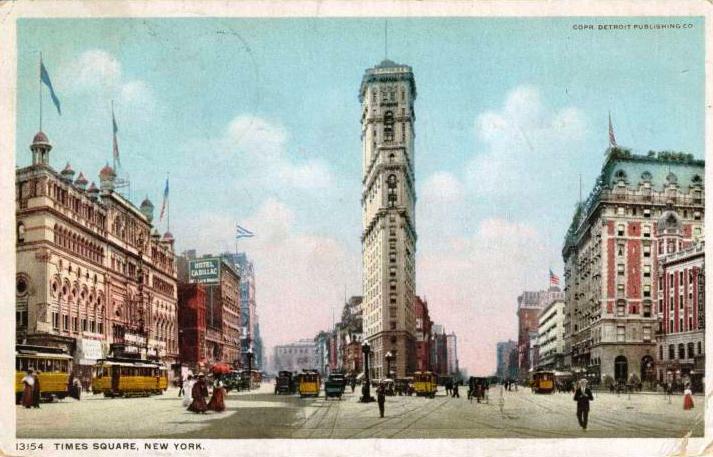 The Hotel Astor was fully electrified including the 12 elevators and nine dumbwaiters. But electricity in 1904 was unreliable at best. Only a month after opening, on October 9, 1904, the crowded hotel was plunged into darkness when the electricity failed. Two unnamed millionaires had been guests in the Hotel Astor since its opening at the time. They were less concerned with electrical outages than with their argument about “the ability of a man to start from New York without a cent, travel around the world and accumulate $1,000 by honest labor in two years,” as explained by The Evening World on October 14, 1904. The Astor Hotel offered complete services to its guests, including the cleaning and shining of boots and shoes. Among the original employees was 17-year old boot-black Marcello Saudo. But after only two months he was fired on December 3, 1904. The fiery teen was incensed at his dismissal and focused his wrath on his replacement, Pasquale Corrado. Corrado had operated a boot-black stand on 14th Street and Seventh Avenue. He now gave it up to work at the Astor Hotel. The new job was a welcome opportunity. The Evening World noted that in the hotel “pay is good and tips are large.” Corrado and his wife lived at No. 335 West 26th Street and had just welcomed a new baby. 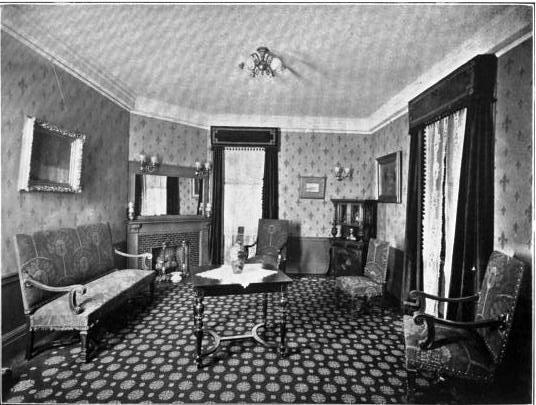 On the night of his first day working at the Astor Hotel, they hosted a christening party in their third floor apartment. Among the guests were Mrs. Corrado’s parents, who lived in an apartment one floor above, and in what must have been a good-will gesture, Marcello Saudo. It was one that ended tragically. The Evening World reported the following day “When the christening party broke up Corrado escorted his wife’s parents to their rooms on the fourth floor above. As they reached the top of the stairs four pistol shots were fired and Corrado fell dead. His mother-in-law, Mrs. Josephine Mesarelo, dropped to the floor wounded twice in her left breast.” Police tracked the teen-aged assassin to the train to Boston and he was arrested the following morning. 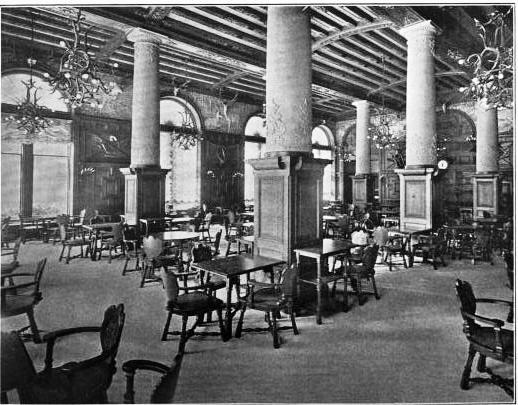 Throughout the decades the Astor Hotel would be the venue for political meetings and dinners, perhaps none of which would be more tense than the clash between suffragists and anti-suffragists at the Fall Convention of the New York City Federation of Women’s Clubs on October 22, 1909. The delay could have been disastrous, but firemen extinguished the blaze before long. “Unfortunately for the hotel the firemen were not sparing of the water and floods of it rolled down to the lower levels of the house through openings in the roof leading to flues and shafts,” reported The Evening World. The fire was confined to the ninth floor; but water damage to the banquet halls on the floor below was extensive. 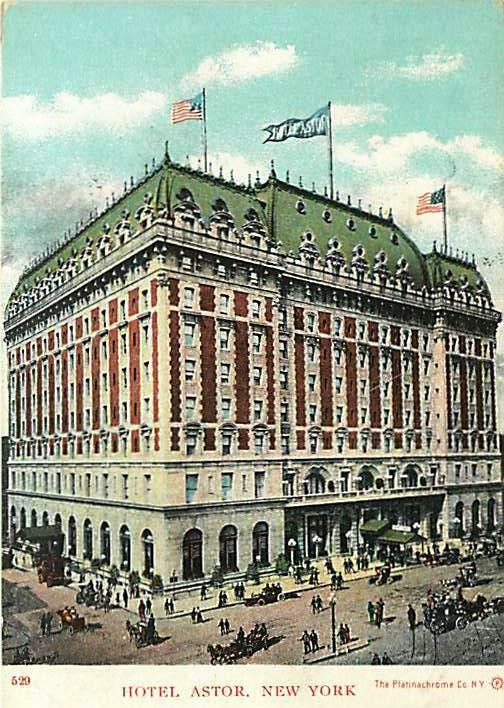 A 1914 postcard shows the Hotel Astor to the right. 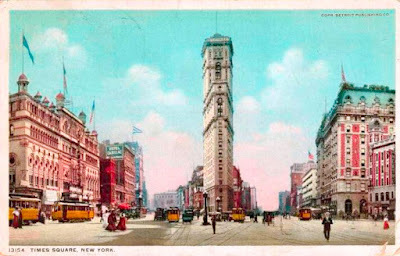 By the end of World War I, Longacre Square had been rechristened Times Square, in honor of the newspaper’s headquarters relocation here in 1904. 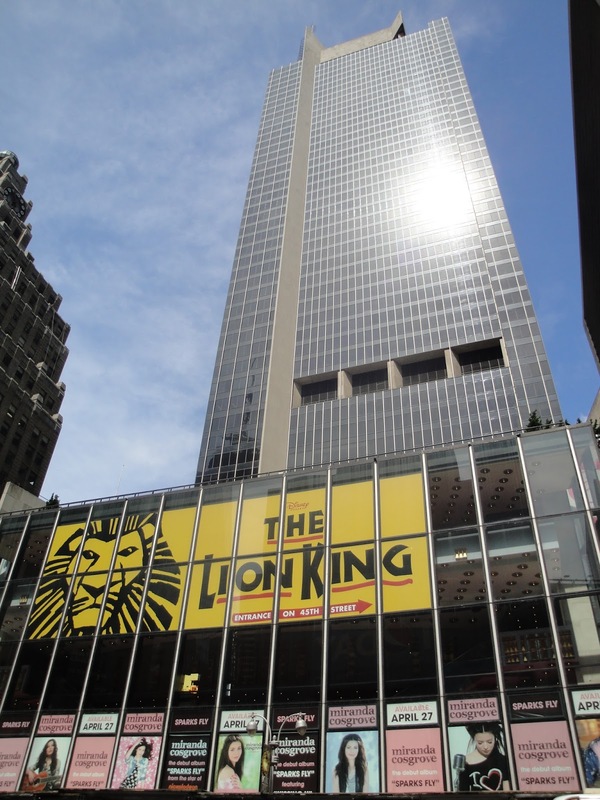 Now the center of the theater district, its location was perhaps a bit too flashy to attract the heads of state and celebrated guests that stayed at the St. Regis and other fashionable hotels. 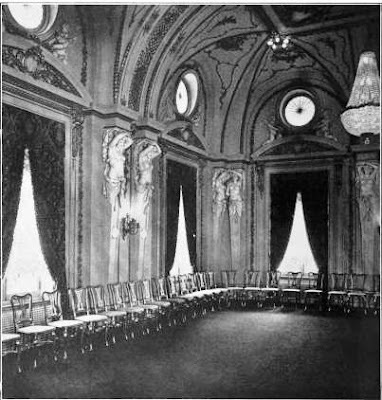 Nevertheless, the Hotel Astor frequently hosted them as guests of honor at banquets, luncheons and receptions; and it was several times the venue from which highly important speeches were made. On February 8, 1932 Winston Churchill spoke here, attacking deflation and advocating restoration of the 1927-28 price levels. President Dwight Eisenhower addressed the National Tercentenary Dinner in the ballroom on October 20, 1954. His speech was broadcast on radio and television nationwide. Other speakers that evening were Governor Thomas E. Dewey and Mayor Robert F. Wagner, Jr. Irving Berlin sang “God Bless America” during the event. Four years later French President Charles de Gaulle was honored at a luncheon in the hotel. A postcard depicts the Astor Roof in the second half of the century. Tommy Dorsey's orchestra played at the Astor for years. Fire Commissioner Edward bluntly declared “There is no doubt that this was the work of an arsonist.” The loss of the ballroom and the income it generated was especially severe considering the business that was expected in connection with the coning New York World’s Fair. 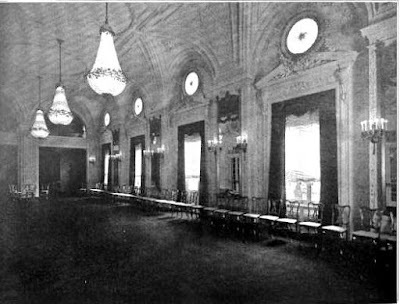 The ballroom was left a burned-out shell for five months before the hotel’s owners Webb & Knapp, Inc. decided to restore it. Work was commenced on a $1 million project at a pace to ensure its completion before the World’s Fair opening in October. Of the only 20 ornamental plaster craftsmen left in the city, 13 were put to work in the Hotel Astor ballroom. On August 26, 1964 Joseph Lelyvelt of The Times wrote “If he had been in town, Louis XIV would have been at home at the Astor yesterday. The hotel’s Grand Ballroom was thick with ornamental plasterers putting the finishing touches on plumes, acanthus leaves, nymphs and cupids. Painters, with the delicacy and preoccupation of coiffeurs, carefully applied gold leaf to the frozen, vacant-looking faces of the nymphs. The imposing hotel was replaced with the 54-story office tower One Astor Plaza designed by Der Scutt of Ely J. Kahn & Jacobs and completed in 1972.